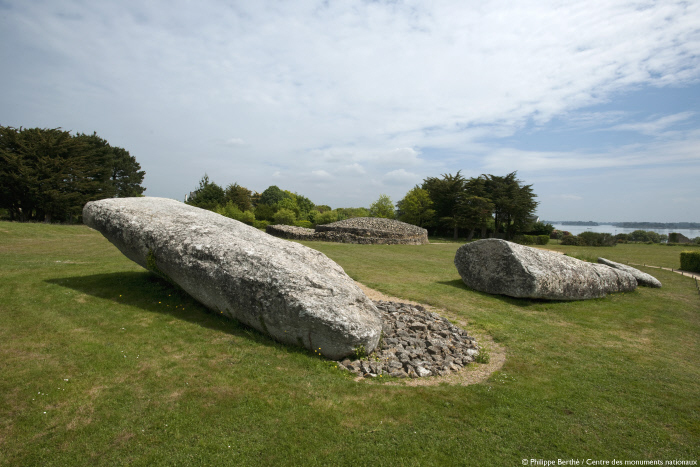 The Locmariaquer Megaliths consist of three separate monuments, each a major part of the megalithic heritage of the Côtes-d'Armor region: the Broken Menhir, the only remaining vestige of a vast complex of steles; the Table des Marchands, which is the main capstone of a family burial chamber featuring a remarkable number of passage graves; and the Er-Grah tumulus, a prestigious and monumental burial structure. A series of archaeological digs in the late 20th century revealed much more about the chronology of the site. As a result of this scientific campaign, a range of new theories have emerged about the engraved art, architecture and history of the site during the Neolithic period. The Broken Menhir, the most iconic of the three monuments, is the most popular attraction among visitors. Its extraordinary size, measuring around 21 metres in length and weighing an estimated 300 metric tonnes, stands testament to the incredible skill and expertise of the builders in the 5th millennium B.C. This extraordinary monolith is a feat of incredible skill, particularly given that we now know where the stone came from: the current northern coastline of the Rhuys Peninsular, some 10 km from its current location!